More than just a cheaper, younger version of Bitcoin, the Ethereum blockchain nevertheless remains a contender thanks to how it fills a highly specific niche. Ethereum is unlikely to ever be as massively valued as Bitcoin, but that’s okay — where Bitcoin is limited to being only about itself, Ethereum has the kind of versatility its older brother only dreams about. There are hundreds of ways Ethereum can be used for groundbreaking crypto projects. In fact, here are three of the most disruptive and world-changing ones. When you think about blockchain and crypto technologies, you think digital coins. However, Ethereum is much different in that its highly distinguishable based on its capabilities. These capabilities are despite the fact that blockchain technology is used to create it — in the same way that blockchain tech is used to create Bitcoin. The Ethereum blockchain was built to support a piece of cryptographic code called a “smart contract”. In essence, smart contracts are self-contained rule sets that can be hard-coded into a blockchain; these smart contracts handle the details of specific transactions on a blockchain. While every blockchain uses at least a rudimentary form of smart contract to handle everyday cryptocurrency transactions, Ethereum is different — its infrastructure permits the use of smart contracts for any number of uses. Ethereum’s efficacy when it comes to smart contracts also allows these pieces of code to work together in tandem. What this means is that highly complex software programs can be created to run natively on the Ethereum blockchain. Known as decentralized apps — or DApps for short — these software applications can be applied to any type of task imaginable. Whether it’s game design, asset management, or resource planning, a DApp can be designed for that specific purpose. DApps that are built using the Ethereum blockchain are, by default, designed to use the blockchain’s Ether token. Yet the same smart contracts that govern the use of these DApps also pave the way for specific, custom token creation. Thanks to a standardized set of rules called ERC-20, developers have a template to create whatever type of utility token they want, as long as they adhere to the guidelines set out in the standard. These tokens are compatible with Ethereum and are often used to work alongside a DApp, either as part of a specific platform, a crowdfunding token sold as part of an ICO, or both. Now that you understand the versatility of the Ethereum blockchain, its full potential is now much easier to grasp — especially when it comes to the diversity of applications. There’s dozens if not hundreds of DApps designed to run on the Ethereum blockchain currently in development, and a great number of them use ERC-20 standardization or exclusive smart contract-based development design. To that end, a full list of these applications or an Ethereum blockchain guide is certainly beyond the scope of this article. However, there’s three that stand out for obvious reasons, either because of their current or historical use. The Decentralized Autonomous Organization — known as The DAO for short — was both the first wildly-successful Ether DApp and also the one that grabbed the biggest headlines when it crashed and burned. A venture capital fund that used exclusive use of smart contracts to automate how it handled investor funds, The DAO allowed users to buy “shares” of the fund in the form of tokens, while the Ether used to purchase those shares was then used in pre-arranged investment strategies. Sadly, this otherwise groundbreaking project fell victim to the biggest culprit when it comes to programming failures — user error. The smart contracts that made up The DAO’s ruleset had some unintentional flaws, with the result being vulnerabilities that, sadly, were exploited by unknown hackers who stole $50 million worth of Ether that investors had deposited into the venture capital fund. The move ultimately spelled doom for the project. Named after the Greek word for knowledge, Gnosis is decentralized prediction market processing project. Focusing on providing automation, transparency, and real-time results to prediction market processing, Gnosis can be used to predict anything you can think of, whether it’s which film is going to win Best Picture at the Oscars or which teams are going to end up in the Final Four. This means that, in essence, Gnosis is a “betting” app. However, it’s much more than that — the impact it has on the gaming industry is manifold. It’s completely transparent and automated, as it doesn’t require user input to distribute winnings. This makes it nearly tamper-proof, reducing fears of graft, theft, illegal activity, false positives, and any other possible negative outcome. Taking human error out of the system ensures everyone has a fair chance of winning with thie Ethereum-built DApp. Designed from the ground-up to provide decentralized access to the kind of computing power you would normally need to have access to a university-grade supercomputer, Golem’s goal is to democratize that type of access by making it easy to lease varying degrees of computing power anywhere there’s an internet connection. Whether you’re a researcher in need of field analysis, a 3D animator looking for computing power to render movie special effects, or testing AI and machine learning algorithms, Golem aims to have you covered. Anyone can rent computing power from the network simply by using the Ether-based token the project created to handle transactions. Additionally, anyone can contribute their own computing power to the project and be rewarded with those same tokens. This sort of transactional community — and the low cost of a Golem token — makes it easy for those of all budgets to gain the computing power they need. We’ve discussed three crypto projects backed by the power of the Ethereum blockchain, but these aren’t the only ones out there. In fact, these are just three specific examples of what smart, resourceful programmers can create through blockchain-based smart contract development. 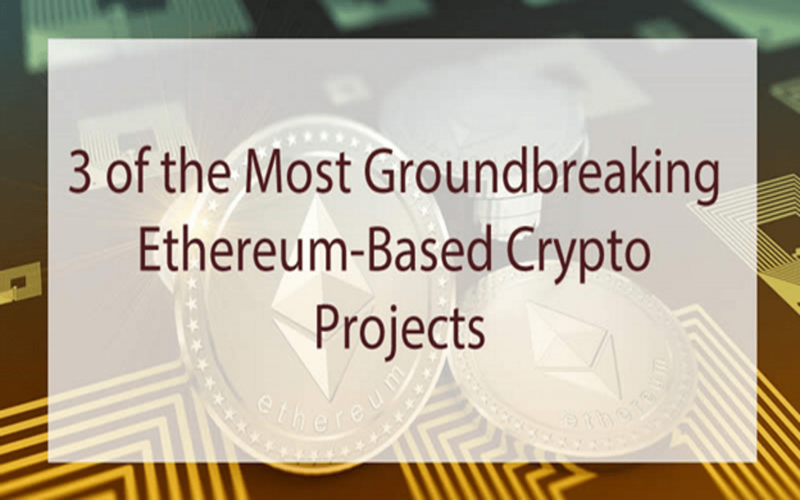 The one thing that links all these projects together is the fact that none of them would ever have been possible without Ethereum’s flexibility and adaptability. It’s true that Bitcoin is likely to keep grabbing headlines in the future, thanks to its volatility and constant price fluctuations. However, Ethereum is unlikely to fade away into obscurity either, as this versatile blockchain will always offer new and innovative ways for developers to create new solutions for old problems. Author: Benjamin Shepardson is the founder of NoStop Blog Content, a Key West-based content agency specializing in delivering personalized experiences. With an extensive digital career dating back to before social media and WordPress.